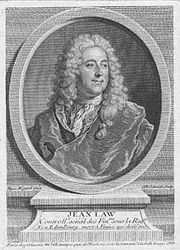 John Law (baptized April 21, 1671 - March 21, 1729) was a Scottish economist who believed that money was only a means of exchange that did not constitute wealth in itself, and that national wealth depended on trade. His popular fame rests on two remarkable enterprises he conducted in Paris: The Banque Générale and the Mississippi Scheme. His economic fame rests on two major ideas: The scarcity theory of value and the real bills doctrine of money. He is said to be the "father of finance," responsible for the adoption or use of paper money or bills in the world today. A gambler, banker, murderer, royal adviser, exile, and adventurer, the remarkable John Law is renowned for more than his unique economic theories. Law was a gambler and a brilliant mental calculator, and was known to win card games by mentally calculating the odds. An expert in statistics, he was the originator of several economic theories, including resolving the "diamond-water paradox" by a method entirely congruent with the much later theory of marginal utility. Law was not just an economic theorist, he put his plans into practice by founding what can be considered France's first central bank. He recognized that gold and silver were too scarce to be used to increase the money supply, which he believed would spur economic development, and so set up the first system of paper money. His scheme failed not because of flaws in his economic arguments but due to the weakness of character of people involved, whose corrupt practices and lack of faith in the government led to his downfall. Nevertheless, John Law is remembered for his insights into the workings of the economy. Although France returned to gold coinage with Law's failure, money in the form of bank notes is now the standard worldwide, issued by central banks, much as Law envisioned. John Law was born into a family of bankers and goldsmiths from Fife, Scotland; his father had purchased a landed estate at Cramond on the Firth of Forth and was known as Law of Lauriston. Law joined the family business aged fourteen and studied the banking business until his father died in 1688. Law subsequently neglected the firm in favor of more extravagant pursuits and traveled to London, where he lost large sums of money in gambling. On April 9, 1694, John Law fought a duel with Edward Wilson. Wilson had challenged Law over the affections of Elizabeth Villiers. Wilson was killed and Law was tried and found guilty of murder and sentenced to death. His sentence was commuted to a fine, upon the grounds that the offense only amounted to manslaughter. Wilson's brother appealed and had Law imprisoned, but he managed to escape to the continent. Law urged the establishment of a national bank, what would now be called a central bank, to create and increase instruments of credit, and the issue of paper money backed by land, gold, or silver. The first manifestation of Law's system came when he had returned to his homeland and contributed to the debates leading to the Treaty of Union 1707, with a text entitled, Money and Trade Consider'd with a Proposal for Supplying the Nation with Money (1705). After the Union of the Scottish and English parliaments, Law's legal situation obliged him to go into exile again. He spent ten years moving between France and the Netherlands, dealing in financial speculations, before the problems of the French economy presented the opportunity to put his system into practice. In May 1716, the Banque Générale Privée ("General Private Bank"), which developed the use of paper money, was set up by John Law. It was a private bank, but three quarters of the capital consisted of government bills and government accepted notes. In August 1717, he bought The Mississippi Company to help the French colony in Louisiana. In 1717, he also brokered the sale of Thomas Pitt's diamond to the regent, Philippe d'Orléans. In the same year, Law floated the Mississippi Company as a joint stock trading company called the Compagnie d'Occident, which was granted a trade monopoly of the West Indies and North America. The bank became the Banque Royale ("Royal Bank") in 1718, meaning the notes were guaranteed by the king. The Company absorbed the Compagnie des Indes Orientales, Compagnie de Chine, and other rival trading companies and became the Compagnie Perpetuelle des Indes on May 23, 1719, with a monopoly of commerce on all the seas. Law exaggerated the wealth of Louisiana with an effective marketing scheme, which led to wild speculation on the shares of the company in 1719. Shares rose from 500 livres in 1719, to as much as 15,000 livres in the first half of 1720, but by the summer of 1720, there was a sudden decline in confidence, leading to a 97 percent decline in market capitalization by 1721. Predictably, the "bubble" burst at the end of 1720, when opponents of the financier attempted en masse to convert their notes into specie. By the end of 1720, Philippe II dismissed Law, who then fled from France. Law initially moved to Brussels in impoverished circumstances. He spent the next few years gambling in Rome, Copenhagen, and Venice, but never regained his former prosperity. Law realized he would never return to France when Phillipe II died suddenly in 1723. He was, however, granted permission to return to London, having received a pardon in 1719. He lived in London for four years and then moved to Venice, where he contracted pneumonia and died a poor man in 1729. The wars of Louis XIV had left France financially destitute and with a wrecked economy. A shortage of precious metals resulted, which caused a shortage of circulating coinage and severely limited the amount of new coinage that could be minted. This was the situation when Philippe d'Orléans, the regent of France, appointed John Law Controller General of Finances. Law's economic fame rests on two major ideas: The scarcity theory of value and the real bills doctrine of money. … water, which has great use-value, has no exchange-value while diamonds, which have great exchange-value have no use-value…. However, contrary to Adam Smith—who used the same example but explained it on the basis of water and diamonds having different labor costs of production—Law regarded the relative scarcity of goods as the creator of exchange value. By following this path, he had most probably anticipated (and thus preceded) the marginal utility theory that was formulated a full century later by Carl Menger, William Stanley Jevons, and Leon Walras. The marginal utility approach implies that when one commodity is very common, and the other is very scarce, a person would have good reason to pay more for the scarce item. This is exactly what John Law was getting at with his “value of exchange” for diamonds vs. “ value in use” for water. If one were to rename “value on use” by “total utility” and “value of exchange by “(high) marginal utility,” Law’s reasoning would fit exactly with the marginal utility approach that resolved the “diamond-water” paradox. Money, Law argued, was credit and credit was determined by the "needs of trade." Consequently, the amount of money in existence is determined not by the imports of gold or trade balances (as the Mercantilists argued), but rather on the supply of credit in the economy. And money supply (in opposition to the Quantity Theory) is endogenous, determined by the "needs of trade." Hence, he initiated what is known as “Law’s System.” The operation involved the floating of shares in a private company—called the Mississippi Company, an enterprise designed to develop the then-French colony of Louisiana in North America—the issue of paper money, and the conversion of government debt. The System ultimately unraveled with a coincident, and dramatic, fall in the market value of both the money and the equity. The first was a virtual takeover of the French government, by which the Mississippi Company substituted its liabilities (shares) for the whole national debt. The second was the substitution of the Mississippi Company’s other liabilities (notes) for metallic currency. At the end of the operation, the Company, owned by the former creditors of the State, collected all taxes, owned or managed most overseas colonies, monopolized all overseas trade, and freely issued fiat money, which was the sole legal tender. Its CEO also became minister of finance on January 5, 1720. To summarize, the System had, two components: One involving an operation in public finance, the other involving fiat money. The operation resulted in the conversion of the existing French public debt into a sort of government equity. Strictly speaking, a publicly traded company took over the collection of all taxes in France, ran the mints, monopolized all overseas trade, and ran part of France’s colonies. This company offered to government creditors the possibility of swapping their bonds for its equity, making itself the government’s creditor. Since it was already collecting taxes, the government’s annual payment was simply deducted from tax revenue by the company. Thus, bondholders became holders of a claim to the stochastic stream of fiscal revenues. All the company offered was an option to convert, and visible capital gains provided a strong inducement for bondholders. As it happened, the System’s other component was a plan to replace the existing commodity money with fiat money, at first voluntarily, later based on legal restrictions. Law used money creation to support the price of shares, and legal restrictions to support the demand for money. Inflation did not follow immediately, but exchange rate depreciation did, leading Law to reverse course and seek ultimately fruitless ways to reduce the quantity of money. The end result was a reconversion of shares and money into bonds and a return to the preexisting arrangements. In retrospect, Law’s System appears conceptually reasonable. Sims (2001) argued that government debt is like private debt in a fixed exchange rate regime, but like private equity in a flexible rate regime; he also regards the latter is preferable. France was notionally on a fixed exchange rate regime (with frequent departures); Law’s System could be interpreted as an attempt to move government debt closer to equity without sacrificing price stability. As for replacing commodity money with fiat money, what incongruity the idea held for contemporaries has clearly dispelled. Law’s System has been called a bubble; it has also been called a default. Quantitatively, it could be seen that the share prices were overvalued at their peak by a factor of 2 to 5, but it may be attributable to Law’s systematic policy of price support. With fairly optimistic assumptions, a lower level of price support would have been feasible. As for the public debt, it was not significantly increased during the System, and it was restored by Law’s successors at roughly its earlier level. In other words, France’s first experiment in fiat money was far from a default, perhaps surprisingly, for a country otherwise prone to defaults. 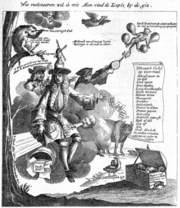 Contemporary political cartoon of Law (1720); text reads "Law loquitur. The wind is my treasure, cushion, and foundation. Master of the wind, I am master of life, and my wind monopoly becomes straightway the object of idolatry. Less rapidly turn the sails of the windmill on my head than the price of shares in my foolish enterprises." In January 1720, just two weeks after John Law had been appointed as comptroller general of finance (minister of finance), a number of large speculators decided to cash out and switch their funds into "real assets" such as property, commodities, and gold. This drove down the price of the Mississippi Company shares, since the speculators could only pay for real assets with banknotes. At the same time, he stabilized the price of the shares of the Mississippi Company by merging the Bank Generale and the Mississippi Company, and by fixing the price of the Mississippi stock at a price close to the original one. With this measure, Law hoped that speculators would hold on to their shares and that in future the development of the American continent would prove to be so profitable as to make a large profit for the company's shareholders. However, by then, the speculators had completely lost faith in the company's shares and selling pressure continued (in fact, instead of putting a stop to the selling, the fixed price acted as an inducement to sell),which led the bank once again to increase the money supply by an enormous quantity. John Law suddenly realized that his main problem was no longer his battle against gold, which he had sought to debase, but inflation. He issued an edict by which banknotes and the shares of the Mississippi Company stock would gradually be devalued by 50 percent. The public reacted to this edict with fury, and shortly after, Law was asked to leave the country. In the meantime, gold was again accepted as the basis of the currency, and individuals could own as much of it as they desired. Alas, as a contemporary of Law's noted, the permission came at a time when no one had any gold left. The Mississippi Scheme, which took place at about the same time as the South Sea Bubble, led to a wave of speculation in the period from 1717 to 1720, and spread across the entire European continent. When both bubbles burst, the subsequent economic crisis was international in scope, plunging France and Europe into a severe economic crisis, which had an important role in setting the stage for the later French Revolution. Indeed, the experience of Law's banking schemes on France were so traumatic that, until recently, the term "banque" was largely eschewed by French banks in order to avoid stoking up memories of Law's unfortunate institution (the common substitute term was "credit," as in "Credit Lyonnais," "Credit Agricole," "Credit Foncier," and so forth). If we were in England, we would have to negotiate with one another and come to some arrangement; in France, however, as you know, I can say to you that you will spend the night in the Bastille if you don't give me your word that you will have left the Kingdom within twice twenty-four hours. Cantillon mulled this over for a moment replied, "Very well, I shall not go, but shall help your system to success." In fact, knowing this summary treatment signaled Law’s desperation and that the end of the mania was at hand, what Cantillon did next was immediately to lend all his existing holdings of stock out to the exchange brokers. Cashing in the paper money he received in lieu of his securities, he redeemed it for gold once more and then promptly quit the country with it, to watch the unfolding collapse—and Law’s final discomfort—in ease and safety. By doing so, Cantillon inadvertently followed an important investment wisdom, which states that once an investment mania comes to an end, the best course of action is usually to exit the country or sector in which the mania took place altogether, and to move to an asset class and/or a country that has little or no correlation with the object of the previous investment boom. He also proved to be a real “entrepreneur” in the whole complicated affair. John Law was a "reckless, and unbalanced, but most fascinating genius" as Alfred Marshall (1923, p. 41) called him, with "the pleasant character mixture of swindler and prophet" as Karl Marx (1894 p.441) added. Law was a man who could lay a justifiable claim to being the "father of modern central banking," even though his Banque Royale was neither the first such institution, nor was it long to survive Law’s eventual disgrace. The initial issues of Law’s notes were fully convertible upon demand into gold coin and so were, assuredly, a blessing. This was because early eighteenth century France was a place where crime and dishonesty meant the transport of money was fraught with danger and where—more importantly—the quality of the coinage in use was so degraded that it was widely distrusted. Law’s banknotes made up for that lack and, at first, they even traded at a premium to the old, clipped, and adulterated coinage which they came to replace. Law, however, had more grandiose ideas than to restrict his bank to this least objectionable of functions. Among them, was a scheme to supplant reserves of gold specie with titles to the much more widely available land, its relative profusion so allowing him to "provide greater liquidity to the market," as we might say today. It is highly revealing that the modern age, in fact, views Law as a sound theorist who sadly besmirched his reputation by succumbing to political pressure, despite his own best instincts. Informed opinion further draws the conclusion that the application of his methods today is eminently sound policy, albeit to be undertaken in a much more prudent manner under the aegis of our supposedly more sage manipulators of the nation’s money. This is, namely, that the crucial, practical flaw of Law’s "System"—whatever could be argued were its underlying, theoretical merits—is precisely that it could be so readily corrupted by the state and that even a giant like Law could find himself so swiftly and helplessly caught in the swirling currents of a maelstrom, to the ruin of all concerned. But what is not so well known is that this was also the time when the phrase "entrepreneur" was first used; the term appearing in a posthumously published work written by a man who first collaborated with Law, then exploited the situation created by him, and finally fell irrevocably out with him. That man was the Irish-born financier, Richard Cantillon. 1705. Law, John. Considérations sur le numéraire et le commerce (Transl. Money and Trade Considered with a Proposal for Supplying the Nation with Money). 1707. Law, John. Mémoire pour prouver qu'une nouvelle espèce de monnaie peut être meilleure que l'or et l'argent. Davanzati, B. 1587. Lezione della moneta. Faber, Marc. 2005. "The Rise to Ruin." In Whiskey and Gunpowder. Marx, Karl. 1894. Capital: A Critique of Political Economy. Hamburg. Schumpeter, J. 1954. History of Economic Analysis. Edited by E. Boody. Sims, Christopher. 2001 "A Review of Monetary Policy Rules" In Journal of Economic Literature. American Economic Association. Vol. 39(2). pp. 562-566. John Law And the Mississippi Scheme. Project Gutenberg Edition of Fiat Money Inflation in France. History of "John Law (economist)"